Join Us for Sunday Worship Service! 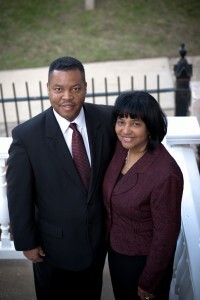 As the Pastor and First Lady of Dexter Avenue King Memorial Baptist Church – we greet you in the name of our Lord and Saviour, Jesus Christ. Historically, the body of Christ here at Dexter Avenue has courageously demonstrated its love for God and His people by being servant-leaders in the cause for justice and equality. By divine providence, the Lord has blessed Dexter Avenue King Memorial Baptist Church with an international legacy which stands on the foundation of love. Today, this body of Christ continues to be committed to a God conscience and a social conscience by engaging in ministry that meet the needs of all people. We continue to be committed to the finished work of the cross by encouraging, promoting, and fostering an atmosphere for spiritual growth through the word of God and through Christ-like living. We invite you to worship with us, to study with us and to serve with us at the historic Dexter Avenue King Memorial Baptist Church!